In the 1980’s, potbelly pigs became the popular exotic pet in North America. This was due to the crazy desire for miniature pets–horses, goats, and pigs–and also in part by the importation of Vietnamese potbellies in 1985 by Canadian zoo director Keith Connell. In 1989, Keith Leavitt imported a second line of potbelly pigs from Europe to Texas; these two lines of potbelly pigs are known today as the Con and Lea lines. According to the California Potbelly Pig Association (CPPA), the vast majority of all registered potbellied pigs in the United States are traceable to these two lines. 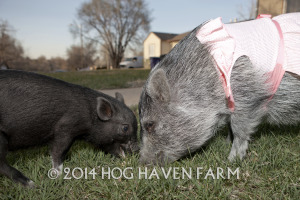 At Hog Haven Farm, we are constantly asked how big our pigs will grow. 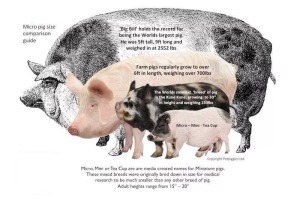 One of the trends for domesticated pigs is the teacup pig craze; many breeders refer to their available potbelly pigs as “teacup,” “mini” or “micro.” These terms are all marketing gimmicks from various breeders and the mainstream media. First and foremost, there is no such thing as a teacup pig! Miniature, micro, nano and teacup are all nicknames for potbelly pigs; they grow, on average, to be 18″ tall (at the shoulder) and weigh between 80-150lbs. However, at the smallest, potbellies can be 50lbs, and up to 300lbs at the largest. Think a 100lb pig is big? These pigs are miniature compared to the standard farm pig, which grow to reach an average 800lbs (they range, on the small side, at 600lbs but can easily surpass 1,000lbs at adulthood). So, yes, a 100lb potbelly pig is small! The reason so many potbelly pigs are in the rescue/rehoming market is due to uneducated owners, and poor information provided by breeders. Potbelly pigs typically will not stay below 50lbs at adulthood. Like people, pigs come in all sizes, and maximum weight will depend partially on genetics, and partially on diet. While potbelly pigs achieve most of their growth by 1 year of age, they reach full adulthood at 3-5 years. Before deciding to own a potbelly pig, do research. Pigs make excellent companion pets, but must have access to an outdoor enclosure to live a happy life. While they are fine as indoor pets, it is important to allow time for grazing and rooting outdoors. We will offer more insight on the habits and lifestyle of pigs in another post. And for more reading and information, please visit the North American Potbellied Pig Association (NAPPA).